BMW M5 Interior, Sat Nav, Dashboard | What Car? 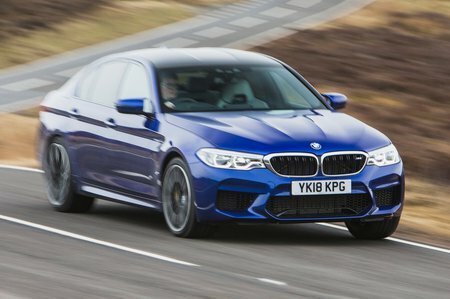 In traditional M5 fashion, there are very few changes between this high-ticket super-saloon and a standard 5 Series. Sure, you get heavily bolstered, supportive sports seats and a bright red starter button as standard, and you can option fancy extras such as seatbelts in M division colours (standard on the Competition) or a multitude of leather and interior trim finishes; but essentially the M5 remains a superbly comfortable, luxurious saloon car at heart. Thanks to a wide range of steering wheel and seat adjustments, you'll find the perfect driving position readily available, whatever your shape. Visibility is pretty good all around but, to help you out, there are front and rear sensors, plus a rear-view camera. The M5 also comes with BMW’s range-topping Professional Multimedia system. This brings a whopping 10.3in widescreen, various online services and even a built-in 20GB hard drive to store your music. It’s one of the best systems on the market and certainly more intuitive than Mercedes’ and Porsche’s systems. 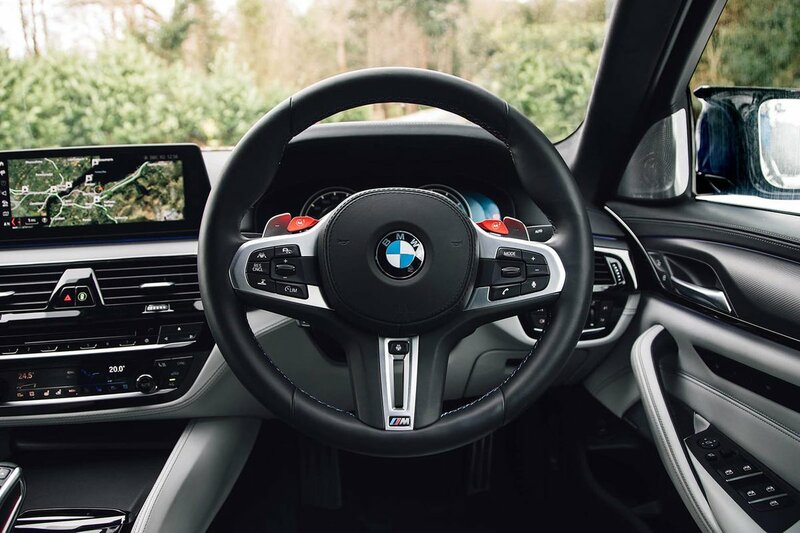 That’s down to the BMW system’s organised menus that can be accessed promptly either through the touchscreen or the excellent rotary controller with shortcut buttons and a handwriting facility. You can even add gesture control, which lets you operate certain functions using mid-air hand movements, although this is more of a gimmick than a useful tool. The standard Harman Kardon stereo system sounds pretty amazing, although you can upgrade if you wish to a superb Bowers & Wilkins one.